A POPULAR walking path at Glen Nevis has been closed following serious rock fall. Tonnes of rocks fell from the slopes above Nevis Gorge overnight on September 13 and 14, leaving ‘significant amounts of debris on the path’. 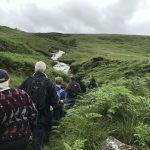 Now conservation charity, the John Muir Trust, has closed the Steall Gorge path, saying it could take until late October before it is given the all clear. Large unstable rocks are covering the path with loose boulders scattered above the footpath, some stuck in fallen tree. The rock fall stared 400m above the path on the Meall Cumhann cliff. The trust has said it has already began surveying the landscape ‘with a view to clearing the debris in the coming weeks’. 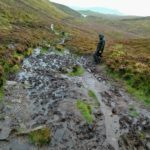 Alison Austin, the John Muir Trust’s Nevis land manager, said: ‘The damage to the footpath is not extensive, but we will need to bring specialised contractors to remove substantial quantities of debris to remove any potential dangers to the public. The closure is set to affect the Salomon Ring of Steall Skyrace, taking place this weekend, and will now have to be re-routed. Ms Austin added: ‘In the meantime, we have provided advice on an alternative route for experienced hillwalkers, including grid references.